Tom Petty, the Rock and Roll Hall of Famer whose music was loved and admired by a number of generations of fans, has died at the age of 66. Petty was found unconscious on Sunday night in full cardiac arrest. Paramedics were able to reestablish a heartbeat and he was rushed to the UCLA Santa Monica Hospital where he was put on life support; however, further tests established that he had no brain activity. He was taken off life support earlier this afternoon. Petty was born and raised in Gainesville, FL and became interested in rock music after meeting Elvis Presley at the age of 10. Tom dropped from high school to form the band the Epics which would would eventually become Mudcrutch with Tom Leadon (brother of Bernie Leadon) along with Jim Lenehan, Randall Marsh and Mike Campbell. Later members included Danny Roberts and Benmont Trench. Mudcrutch signed with Shelter Records in 1974 where they released just one unsuccessful single, "Depot Street" and, although they had recorded other material, they were released in late 1975. The following year, Petty, Campbell and Tench formed the Heartbreakers with Stan Lynch and Ron Blair and, in November of 1976, released their self titled debut on Shelter. The album included the now standard "Breakdown" and "American Girl" but was initially not a major hit in the U.S., only going to 55; however, it made it to 24 in the U.K.
Their second album, You're Gonna Get It! did better, hitting 23, but it was 1979's Damn the Torpedoes that put Petty and the Heartbreakers fully on the map with such songs as "Refugee", "Don't Do Me Like That" and "Here Comes My Girl". The album remains the Heartbreakers' biggest selling studio album at over three million copies. The 80's continued to break new ground for Petty and the group with such albums as Hard Promises (1981), Long After Dark (1982), Southern Accents (1985) and Let Me Up (I've Had Enough) (1987) which included such hits as "The Waiting", "You Got Lucky" and "Don't Come Around Here No More" which were anchored by cutting edge videos during the early days of MTV. Petty started to branch out late in the decade. In 1988, he joined The Traveling Wilburys with George Harrison, Bob Dylan, Roy Orbison and Jeff Lynne and, in 1989, released his first solo album and biggest of his career, Full Moon Fever, which peaked at 3 in the U.S. and has gone six times platinum, outsold only by the Heartbreakers Greatest Hits which has sold over twelve million units. 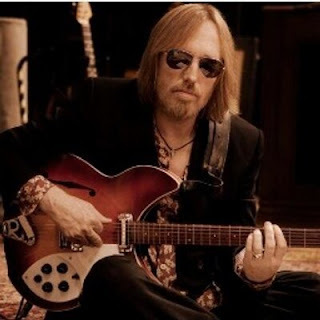 Tom went back to work with the Heartbreakers in 1991 for the album Into the Great Wide Open and, for the rest of his career, would spend time between the band, two more solo sets, a second Traveling Wilburys album and a reformed Mudcrutch which released studio albums in 2008 and 2016. Petty also dabbled in acting starting with the 1978 film FM and including credits in Made in Heaven, It's Gary Shandling's Show, The Larry Sanders Show, The Simpsons and King of the Hill. Tom was married twice and has two daughters, Adria and AnnaKim. Wow. This is hard to take. So very sad. To say he will be missed is not adequate. Heart goes out to his family, friends and fans. Music will live on.